The Panasonic Lumix DMC-GH2 offers a winning combination of high-quality stills and video, proven handling and design, and a more affordable price-tag - it's simply the most complete interchangeable lens camera currently available for people who want to shoot in both formats. Panasonic certainly haven't been idle since they released the original GH1 model in March 2009, adding a veritable plethora of new features and improvements to its successor in order to keep ahead of the competition. The GH2 may look very similar, but both the video and still image quality have been significantly improved thanks to the new 16 megapixel sensor and Venus Engine FHD processor, the lightning-quick auto-focus speed has to be experienced to be believed, and the touch-screen interface is a genuinely useful addition to an already well-thought-out design. 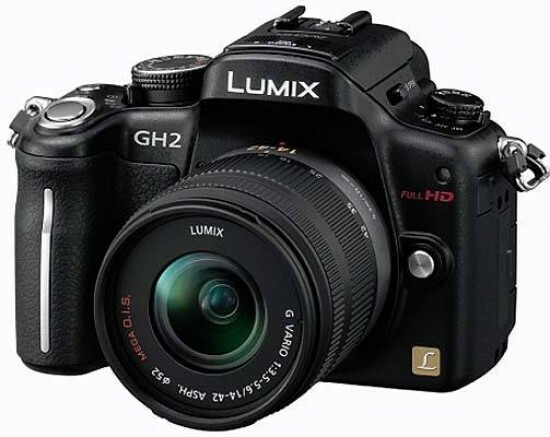 Just as we said about the GH1, if you're looking for high-definition video in a DSLR-like format, then the Panasonic GH2 is your best choice. Canon and Nikon may have recently made significant strides with their 2010 DLSR models, but they can't compete with the GH2. The ability to continuously auto-focus during recording is faster on the GH2 than on Nikon's cameras, with Canon lagging even further behind, and the sheer quality is visibly better than the GH2's main rivals. The EX Tele Convertor mode is the icing on the cake, allowing you to record Full HD footage with less scaling or image processing required, again resulting in great looking video. The GH2's still image quality is also improved, especially the high ISO performance, impressive given the increase to 16 megapixels. Images shot at ISO 160-400 are clean, with a little noise appearing at 800 and more at the still very usable settings of 1600-3200. ISO 6400 is best reserved for resizing and smaller prints, while the top speed of 12800 is only for emergency use, but overall the GH2 offers the best image quality of any Micro Four Thirds camera to date. It still can't rival the best APS-C DSLRs, but the gap has at least narrowed. The contrast detection auto-focus system is amazingly quick when certain lenses are used, at 0.1 seconds over twice as fast as the already speedy GH1, and importantly it's very reliable too, even in low-light. If you've always preferred the traditionally faster phase-detection systems of a DSLR, then the GH2 is here to change your mind. The 3 CPU-powered Venus Engine FHD also ensures that the GH2 is no slouch in other areas of its operation, with 5fps burst shooting, no lock-up between shots and instant image playback. The new touch-sensitive screen further enhances the refined interface of the GH1, delivering all the convenience and more of a compact camera shooting experience in a DSLR-like package that is smaller and lighter than most DSLRs. Panasonic have wisely ensured that only certain key features can be configured by tapping the screen, rather than simply making everything accessible in this way, creating a hybrid interface that genuinely speeds up the camera's operation. You don't have to use the touchscreen at all, but you'd be mad not to. Panasonic have also laregly addressed one of our few criticisms of the original GH1 - its price and bundle options. You could only buy that camera with the well-matched 14-140mm lens, fine if you wanted the best video lens that Panasonic offer and were prepared to pay the subsequent high asking price, but not so good if you preferred a different optic or you already had some compatible lenses. Now the GH2 is also available with the cheaper 14-42mm kit lens in the US and UK, and even better as a body-only option in the US (we hope that Panasonic UK follow suit too), drastically reducing the initial cost of ownership. Overall the Panasonic Lumix DMC-GH2 is a fantastic all-rounder that delivers the goods for both photographers and videographers alike. If you're a stills shooter who wants to dip their toe into the world of moving images, or a film-maker who wants the best quality video from an interchangeable lens system camera, then the new Panasonic Lumix DMC-GH2 will more than meet your needs.